Right. Well I actually read this book a little while ago; I can't remember the date. But whatever. I read it quite quickly and I wasn't sure if I should re-read it before I wrote my review. But while I was on a drama camp recently the subject of bullying, snowball effects, and depression came up, I decided to just write it up. So here goes. 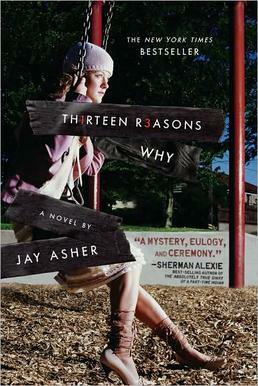 My understanding is that Hannah sent the tapes to every single person that influenced her decision to die — or in Clay's case, could have influenced her NOT to commit suicide — so that they could become more aware of how THEIR decisions during the time period shown in the book influenced HER decision to commit suicide. (view spoiler) I wanted to appear into this fictional Hannah's life and drag her away and somehow help her, and it was really mood dampening at times, because as the story progressed you as the reader could clearly see her spiral and you were helpless to stop it and argghhhh it was painful to read and yet I just had keep reading it 'cause I couldn't just stop, which sucked because I felt like it was almost my fault because I got so wrapped up in the story, which is why it's not one of my favs of favs; since those kinds of depressing feelings I tend to shy away from in books, but I still loved the story because I thought the message was so touching and inspirational. I've heard some people say that this book was life changing, and others say it was garbage because the reasons were so meagre (and I just wanted to mention that they might seem meagre to some people, but that should be expected, because individually each reason might be meagre, but it was the reasons as a whole, one after the other in relentless succession that had a significant effect on Hannah's mental wellbeing and eventually her suicide. The snowball effect). For me, tho I thought it was a really interesting and thought provoking book, it wasn't personally life altering. What I mean is, while it made me think about how what I or anyone else does or doesn't do could effect those around me, I didn't completely reinvent my ideals or whatever. Anyway, what I felt the author was trying to express and put across to us by writing this book is that everything you do, or don't do, has an effect on others. Whether good or bad, conscious or not, there are always causes and effects to your actions or lack of. And I guess the purpose was to open our minds more to that concept, and demonstrate how people can become more aware of this, (view spoiler) I really liked this ending because it felt like Hannah's death and the tapes had been a success. That all of it wasn't meaningless because at least one person who received the tapes had truly understood what she was trying to say even in death, and THAT was gratifying to read. Loved this book!!!! Glad to see you enjoyed it also!